Following our very successful – 79 species – Amazon trip in 2017, we are in the very early stages of planning a new Amazonian mammal voyage for October 2019. 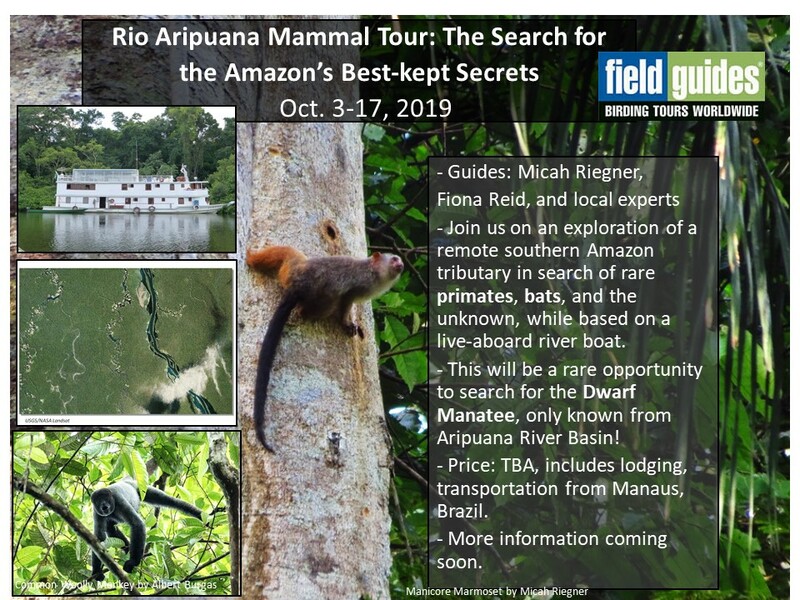 This time we will be exploring the remote Rio Aripuana in search of a different set of mammals including the newly described Dwarf Marmoset and the enigmatic Dwarf Manatee, known only from a single creek in the Amazon Basin! The animal resembles the Amazonian Manatee genetically, yet is much much smaller and has a different diet. Other species we hope to encounter include Manicore Marmoset, Common Woolly Monkey and Prince Bernhard’s Titi Monkey along with some exciting bats, rodents, dolphins and many of the commoner Amazonian species. Plus who knows what else! More details coming soon but if you are interested please let me know. This should be one exciting trip, right on the frontier of mammal watching, and space will be limited to fewer than 15 people. Have any of the 10+ “new species” Van Roosmalen has claimed since ~2002 been independently confirmed? He made several legitimate and impressive discoveries before then, but I haven’t seen any corroboration of his more recent claims. Also, how does one go about searching for Amazonian Manatee? They are so elusive that researchers have resorted to using sonar to locate them. Did you see that Van Roosmalen has compared skulls of the dwarf manatee with immature adults of a similar size from elsewhere: the dwarf manatees had worn molars. So it sounds like they are not simply immature animals. Apparently there’s a creek we can reach at that time where they congregate so sightings seem pretty likely. 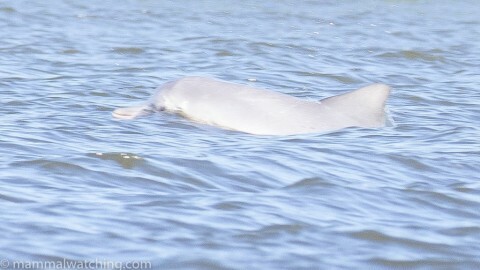 I’ve only seen an Amazonian Manatee once ( near Tapiche) and then only fleetingly. I’ve seen them a few years ago and I’m 100% sure they shouldn’t be a full species. There is a lot of size variability in Aripuana and in other rivers, too. That said, they are a good subspecies and really nice animals to watch. But then, you are a notorious lumper. I like splitting just because it is more fun! Hi Jon. My wife and I are interested in learning more when you know it. Good to know. Whatever they turn out to be taxonomically, they’re still a fascinating case of dwarfism. I’d be curious to know too if there are any vocal differences between the taxa (apparently, manatees are pretty vocal!). Would make for an interesting study. Hi Jon- my husband and I are interested in learning more. Looking forward to hearing about it! Lindsay and I would be interested in hearing more when you know more. I am also interested in the trip. P.S. Concerning the Dwarf Manatee: Its existence is not confirmed! It was described by Dr. Marc Van Roosmalen. I saw ssome of his photos.